Football legend Pele told Kylian Mbappe that he believes the French World Cup winner can emulate his own achievement of scoring 1,000 career goals. The 78-year-old Brazilian claims to have netted over 1,000 goals in his career, while Mbappe has so far managed 103 in total, with 92 of those coming at the top level. 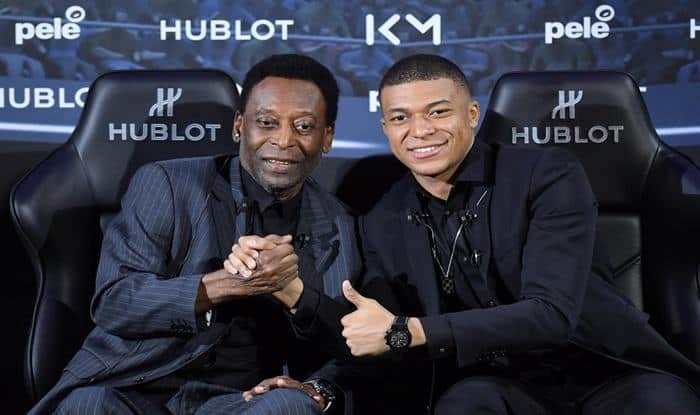 “It’s possible, I scored exactly 1,025, so 1,000 goals is possible for him,” Pele was quoted by AFP in Paris, where he met Mbappe at a sponsor event for Hublot watches. Mbappe has scored 32 goals in all competitions for PSG this season, including 27 from only 24 Ligue 1 appearances. Pele was only 21 when he won his second World Cup in 1962, adding a third eight years later. “There’s only one ‘King’ and he’s there,” said Mbappe. “I’m just Kylian, I’m trying to do my best to help my team and my national side. It was not the first time that Mbappe has had to temper comparisons with Pele, after a rush to crown him a future footballing great during the World Cup in Russia, where he scored four goals in total. But the former Monaco striker insists that he is not focused on becoming the best player of modern times. “When Pele was playing, he didn’t think he wanted to be the best player in history, he wanted to have fun, help his country and his club, which he did,” he said. “Everyone says that he is the best, but if you are (the best), there’s no need to say it. It’s not a goal for me.” Pele spent the majority of his career at Santos in his home country, bar a spell in the United States with the New York Cosmos shortly before his retirement.